Congratulations! You just found out you’re due with your second baby. Now you have a toddler to run after and you are wondering how am I going to manage this? Well, good news is that you have a lot of experience with babies now!! More than you had before, right? We are expecting our second child early January and it has been such a different experience already for us. First of all, it is going SO fast because I don’t even have time to stop and think about anything as I am chasing around my 2.5 year old. I also felt sick this time around in the first trimester which I didn’t before and of course I thought, oh it must be a girl! But nope, it’s another boy! And we are thrilled! So how do you prepare yourself and your child for another baby? Talk to you little one about the new baby. Bring them to the doctor’s appointments so they can hear the heart beat and make it more “real”. My son loved pushing the button on the heart monitor and had all sorts of questions after about the noises we heard. Involve your child in the count down for the baby. My son was always asking, “Mommy, when is the baby going to come out and play?” So, I told him a concrete answer that he could understand – I said, when the snow is on the ground and we have a Christmas tree! He loved that. You could also get out a calendar and mark off days until baby comes which could also be a good learning opportunity with numbers! Try to keep routines as regular as possible in the days and weeks around the baby’s arrival. If you plan to make any room shifts to accommodate the baby, do it a few weeks before your due date. If you are planning to wean the pacifier or potty train, make sure to do this at least 2-3 months before your due date as regression can be common after baby comes. Get a doll for your child – whether you have a boy or a girl I think it is a good idea to get them their own baby doll to hold, feed, change diapers, etc. so they feel like they are involved in the process. 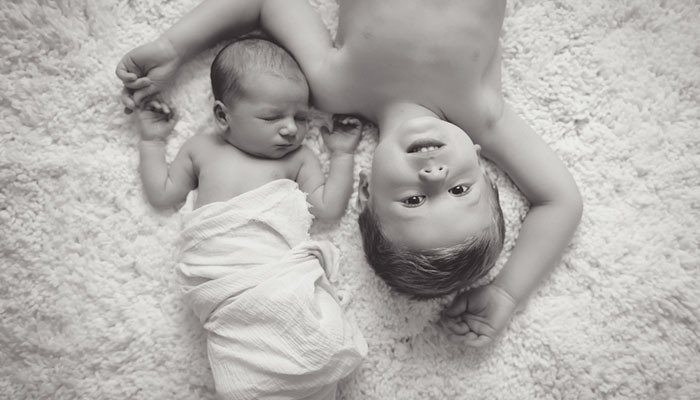 You can also involve your little one as much as possible – ie: “Time to change baby brother’s diaper! Please go get Mommy some diapers and wipes!” They love to be big helpers at this age. Don’t expect your little one to instantly love his/her new sibling, they tend to get jealous but this is normal! It takes time for them to adjust. They aren’t used to sharing mom and dad but what I would recommend is spending some extra time with them when you can (even if it is just going for a quick walk or to the park) without new baby so it feels very special. Also, it is normal for your first child to get closer with your partner after baby comes because naturally, they have more time to spend with them one on one vs. you if you are busy with feedings, etc. Last but not least, the more you can do to assure your older child that they are still loved, the smoother the transition will be. Personally, as number 4 of 5 children in my own family, I still remember how I felt the day my brother came home from the hospital. I was so excited for my new baby brother but also felt the shift in the house hold. My parents made sure to make special time for each of us and I never felt deprived of love. Best of luck to each of you on your journey through parenting and we at South Lake Pediatrics are so excited to meet your newest addition. Previous Post: « So how did it really go? Congratulations Jamie!!! We might be in with a #2 at some point too, so we are starting to think about all this! Thank you for writing it! !